Do you want a whiter and brighter smile? Teeth whitening is a safe and an easy procedure that can lighten discolored or stained teeth.The natural color of teeth is not naturally meant to be completely white, many Mauritians want a brighter smile. Teeth naturally darken with age and their appearance can be affected by the use of tobacco products and the consumption of certain foods or drinks.While a dental cleaning can remove some staining, Teeth whitening can provide patients with great results that whiten the color of teeth which have discolored over time. Teeth whitening, if maintained correctly, can leave patients with results that last. As teeth whitening gels have different levels of peroxide in them, all procedures should only be carried out by qualified dentists who use a clinically proven cosmetic dental treatment. In-office professional Teeth whitening is an easy fast and non-invasive cosmetic procedure with immediate results. The whitening agent is used in combination with the power of light accelerator to remove stains in one treatment. In-office Teeth Whitening treatment has no long-time negative impact on the enamel, the gums or teeth dentin. Teeth whitening is typically kept out at home by the patient following a consultation with a dentist. The procedure of teeth whitening may not be appropriate for all patients, so before starting any teeth whitening procedure it is the best to discuss expected results and estimated time with a dentist. If necessary, the dentist will take print of your teeth to prepare a custom-made mouth tray in a dental laboratory (ADB Dental Laboratory, Mauritius, Floreal, Forest Lane). The tray is used to hold the whitening agent close to the teeth. Whitening agent is placed on the tray which is then worn for up to 2 hours a day. Results are usually seen within two weeks. Your dentist will explain you on how long to wear the tray both initially and for maintenance. 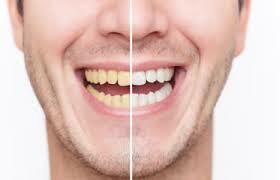 In some cases, teeth whitening procedures are provided in office by your dentist. The teeth whitening agent is placed on the teeth and the whitening process activated by use of special ultraviolet light. Teeth sensitiveness and irritation of gums can occur during bleaching/whitening treatment, but these effects are transitory.